A fun fact to start this Kodak ColorPlus 200 review with. This was the first film I bought and shot after picking up my first couple of film cameras from a charity shop. That’s because it was the only film they had in my Tesco, which actually isn’t much fun at all. But it is still a fact. I’ve shot a few rolls of it now, in those cheap point ‘n’ shoots and also in a Yashica Electro 35 GSN, so I’ll include images from a range of them in this post and let you make up your own mind on their quality. They might even push you to pick up some ColorPlus yourself, and you won’t have to go to Tesco to do so. Not when they have it on Amazon, eBay, and at Analogue Wonderland. What is Kodak ColorPlus 200? Kodak ColorPlus 200 is one of the cheapest colour negative 35mm films still available. Cheaper than the longtime Kodak budget favourite Gold 200. But, as we’ll see later, don’t let that put you off. It’s a stock that isn’t sold in all parts of the world although I’ve found it to be readily available in Asia and, as mentioned, the only one available in a huge supermarket in my hometown. The subheading of this section – what is Kodak ColorPlus 200? – is perhaps more pertinent than you realise. As you can see below, the canister doesn’t match the box. It’s a different design and is strangely labelled Kodacolor 200. With no mention of either of these films on Kodak’s own site alongside the Portras and Ektars of this world, there is some confusion about what ColorPlus actually is. That’s not to say there’s no information about it floating around though, and a little digging has led me to this goldmine of knowledge. So based on what I found there, this is a summary of what I believe Kodak ColorPlus really is. You can click the links to see the images I mention. Kodak released a film called Kodacolor II in 1972. This was replaced by Kodacolor VR 100 in 1983. The VR range of films was based on technology used in old Kodak disc films. Because these disc films had a higher agitation rate, Kodak found the Kodacolor emulsions had their speeds doubled. The ISO 100 emulsion effectively became ISO 200. You can see from the picture on that site that today’s ColorPlus canister matches the old Kodacolor VR box pretty well. This table gives a chronology of the film family, from 1972 to 1990. It states the 100, 200, and 400 35mm Kodacolor VR films were replaced by Kodacolor Gold in 1987. Below the table is an image of the film boxes, featuring a familiar-looking yellow and red one, albeit still labelled Kodacolor 200. 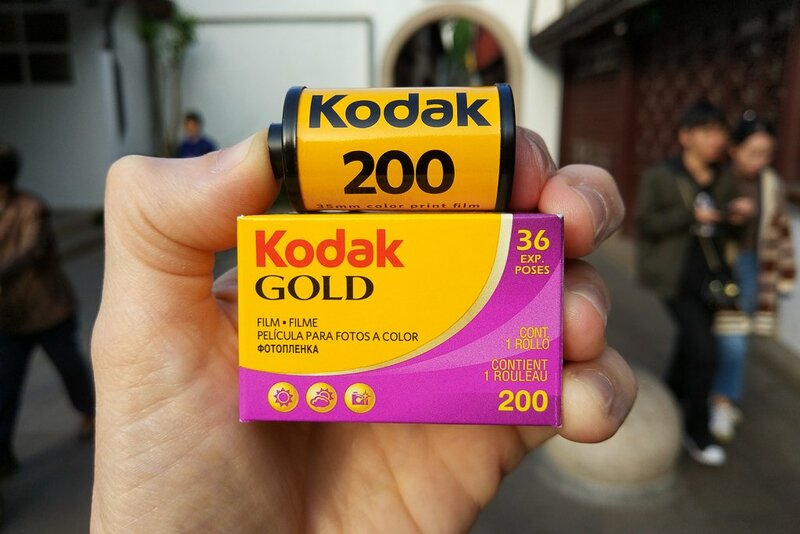 Dating from 2001, this was the same film as the Kodacolor 200 in the more common pink and yellow packaging (which in turn was repacked Kodacolor Gold 200), just with a different design for the European market. There’s also an all-yellow box that seems to be an early version of a ColorPlus. This is dated as being from 2007 and was apparently made in China. It looks like somewhere along the way, the ColorPlus name and the red and yellow box were merged to create the film we’re talking about today. It gets murky and I could be wrong, but the lineage seems to be Kodacolor II –> Kodacolor VR 200 –> Kodacolor Gold 200 –> Kodacolor 200 –> Kodak ColorPlus 200. I’ve shot Kodak ColorPlus in a few different cameras and in a few different conditions. The first rolls were in a Canon Sure Shot AF-7 point ‘n’ shoot on an overcast day and an Olympus Supertrip point ‘n’ shoot on a sunnier day. The last roll, shot in a Yashica Electro 35 GSN, was also lucky enough to be given some good light. In all cases, the results benefit – depending on your taste – from the film’s inherent warm tones. When it’s overcast, they make it appear less so. When it’s sunny, they don’t make the light appear cooler than it was. It’s not a huge Instagram-filter style effect in either case, but it is on the right side of neutral if you like warm shots. Overall, the colours look more natural than you get from Fujicolor Industrial 100, for example. Having said that, there is a certain vintage look to the photographs, which makes sense if we’re shooting with an older emulsion. This look is helped by that yellow hue but also brought on by the contrast you get and the grain, which is noticeable but never overbearing, in my opinion. I’ve had a couple of sunny day shots come out slightly overexposed, with none of them shot on fully manual mode it should be noted, so perhaps the film doesn’t give as much leeway in that sense as others you may be used to. Regardless, here are some shots taken with the Canon Sure Shot AF-7 to show you what’s possible with a cheap camera on an overcast day. Kodak ColorPlus 200 seems to be a good film for your street photography for a number of reasons. First is that price. As mentioned, it’s one of the cheapest colour negative films out there today. With the sometimes hit ‘n’ miss nature of street photography, an inexpensive film could save you a lot of cash in the long run and give you more freedom to shoot every time you go out. Another cheap colour negative film is the aforementioned Fujicolor Industrial 100, which I reviewed here. The price is comparable to the ColorPlus and it’s another fine product for what you pay. The ColorPlus does give you more shutter speed to play with though with that higher ISO rating, which will always come in handy on the street. Kodak Gold 200 is another film that won’t break the bank and brings that ISO 200 too, but it’s still not as cheap as the ColorPlus. Depending on the aesthetic you’re going for with your street photography, those sunny hues can be a good thing or a bad thing. But at least you know what you’re getting before you shoot. If you want something cooler, perhaps go for Fujicolor C200. The following five shots are from the Yashica Electro 35 GSN. As you can see, the day was sunnier than for the previous three example shots. Kodak ColorPlus 200 is an ISO 200, 5500k daylight balanced, colour negative 35mm film that’s available in rolls of 24 or 36 exposures. It’s DX coded and is developed using the common C-41 process. I don’t develop my own film but I can point you in the direction of some information regarding doing so if you need it. First stop is the site we looked at earlier. If you start from here, it runs you through the C-41 or Flexicolor process and includes all the temperatures and times you need. I couldn’t find a Kodak ColorPlus 200 datasheet anywhere but I did find this original Kodacolor II manual, which I believe is where ColorPlus can be traced back to in one way or another. I like this film. That’s a good final thought to have, but probably not enough to end this on. So let’s expand. Also let’s get the negative things out of the way before we get to the positives. First up, the name. I get they probably want to differentiate it from the Portras and Ektars but come on. ColorPlus is a terrible name. Even Kodacolor 200 was better. Second, that box. I can’t think of any film with a worse box than this garish number. The canister looks great. Go back and match the box to that, Kodak. The film itself may also suffer from what makes it great, and that is its versatility and budget price. It’s like a jack of all trades and master of none. So if you’re shooting fine portraits or tremendous landscapes, there are other more expensive films that will be better suited to the job. For me though, as someone who does a lot of street photography, that’s a reason to like it. I want something inexpensive and versatile. I guess the stock comes from an era when everyone was using film for their holiday snaps, so it needed to handle a lot of different situations but didn’t need to excel in any single one. That might also be why it was given the warmer yellow hues, to give people fonder memories than a cooler film would, which would encourage them to buy more. Either way, this makes it good for your travel shooting today, or just everyday snapshots wherever you are. With Agfa Vista Plus 200 being discontinued and FujiFilm slowly reducing their offerings too, ColorPlus might be the future of cheap and low ISO colour film. That wouldn’t be a bad thing in my opinion, as it’s never given me a reason to complain about the results I’ve got from it – especially at the price it’s available for on Amazon, eBay, and probably your local film shop too. … p.p.s. if you found this film review useful and think others will too, why not share or pin it?